On September 23, Ozma and Living Archives organized a seminar for the Living Memories (Levande minnen) project at Medea, Malmö University. Attending were researchers from Living Archives, archivists from three Nordic Folklore archives (Folklivsarkivet i Lund, Norsk Folkemuseum and Dansk Folkemindesamling), representatives from the department of Cultural Sciences at Lund University, and the game studio Ozma Games. The aim of the seminar was to start discussing questions around how to modernize the methods used by archives and archivists to collect stories from the public, and how to share the historical material of the archives. After a general introduction by Ozma, the initiator of the project, Veera Kinnunen from the University of Lapland gave an inspirational lecture about Objects and Memories (lecture is available here). The three participating archives gave an introduction to their work and the seminar ended with a workshop where four areas were explored: Methods for collecting stories, Rights and ethical questions, Using the historical material, and Sustainable financing and organization. See also Veera Kinnunen’s lecture Managing Things, Managing Memories, pictures from the seminar, and the original seminar invitation. The theme of the first group was ‘methods for collecting stories’. We started by discussing how to deal with the fact that today’s media landscape is international, which has the implications that what happens in one country often affects people all over the world. In particular, this discussion was with regard to the July 22, 2011, terrorist attack, which must be said to have affected not only Norwegians. But, when the Norwegian Folklore Archives wanted to collect stories of “commemorative practices in the aftermath of July 22”, they only asked Norwegians. The questions is then: How and why do you set the boundaries for whom to ask? Another theme was whether it is possible to collect stories “secretly”, e.g., by crawling what people write on social media platforms. There are of course many ethical issues here. It was agreed that when researching collecting methods, it is important to start with deciding what practices it is you want to support and not start with the tools. A collecting method that may be used is through social gatherings where material is generated in conversation with others (as opposed to being created in a monologue). This might be called “social memory processing”. These social events are often fun and empowering and has been used in the Living Archives sub-project Women 100. The group also discussed what incentives there might be for people to contribute material to folklore archives: for example, a graceful disposal of memories, enjoyment of exploring memories, the joy of sharing to a willing listener, to be recognized, to be part of history, and that the collecting has the potential to be a ‘social’ thing (if done as a conversation instead of a monologue). Challenges: Rights, ethical questions, platforms etc. Our discussion centered around openness and control. When a user submit data to an archive, how can the user be in control of it? If the archives are going to be open, the informants have to be able to dictate how the materials may be used. Many donate to archives to let researchers look at the materials, but they don’t expect the archives to be public and open for everyone to use. When the data and materials can be used and remixed, the archives become a channel instead of a landing space. We considered the ethical issues more complex than the juridical issues. We also talked about that there can be a certain protectiveness around the archives today – even if they are supposed to be open for the public to use. We had some ideas around crowdsourcing, where people could submit materials, for example texts, music, video, pictures, that could also be linked to a location on an map. If large amounts of text would be submitted, using text analysis could be a way to auto-tag materials. Crowdsourcing could also be used to transcribe old texts. In this workshop we started out discussing the roles of archives and archivists. What content does the archives provide, and what is actually considered to be historical material worth archiving? As pointed out, what we archive today is historical material tomorrow, and the role of the archivists as gatekeepers, filterers, and interpreters of the present has to be acknowledege and understood. Archiving practices might be seen as an act of “curating memories”. Also, it is important to remember that when using archive material, we ought to understand the context it was gathered within. Today, all public archives seem to use similar sets of tools to both generate and access data, but who is actually invited to generate or access that data? Maybe one need to ‘package’ archive material in a more attractive way in order to make it more relevant to young people, or other user groups that seldom make use of the content in our public archives. The most common visitor/user of our archives are students, researchers, genealogists, people with special interests (e.g., senior local historians), and journalists. Maybe it is a question of ‘letting go off the material’, which is a controversial thing for most institutions since this ‘letting go’ has many ethical questions. The copyright matter is actually not much of a problem since the archives contain lots of old material that are copyright free. A larger question is how to deal with questions regarding manipulation of the material, and what happens when it is taken out of its context. An example referred to dealing with these matters is a project in Lund where historical audio material was made into ringtones. Historical material was used in a ‘non-scientific’ way, and the ringtones turned out to be popular among young people. We briefly touched upon the potentials of creating a digital tool for ‘scrapbooking’. 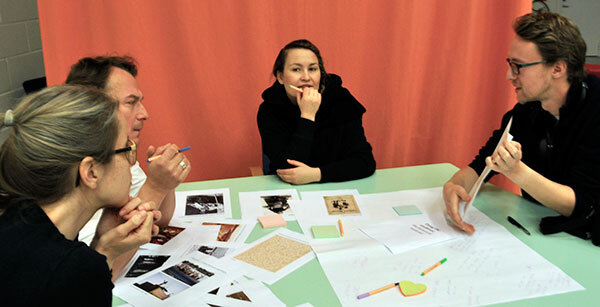 The participants agreed upon that it would bring new and vital perspectives to the practices of archiving. One suggestion was to create scrapbooking events, and salons for storytelling. Scrapbooking and storytelling as tools that mirror ourselves in the past, and present. Tools that help us understand our place on earth, our roots, the past and the future. Financing and organisation: how to make it happen? I (Karin) was alone in the workshop where the subject of financing and organisation was to be discussed. This was maybe not so strange considering that Ozma is the only company involved in the project, although we need to address this together in the future in order to make the project sustainable. I thought about how this project needs to be organised with dedicated people from the different archives who are responsible for evaluating the tool. The question came up whether all the archives involved share the same tool or if we make several versions. There needs to be ways of updating the tool and adding new content continuously. We are already trying to fund this project with regional, Swedish, and Nordic culture funds. The question is if we need to add a business model to the tool to make it sustainable for the future? And is it possible for the archives to actually earn money from such a service? More detailed notes from the seminar is available here.